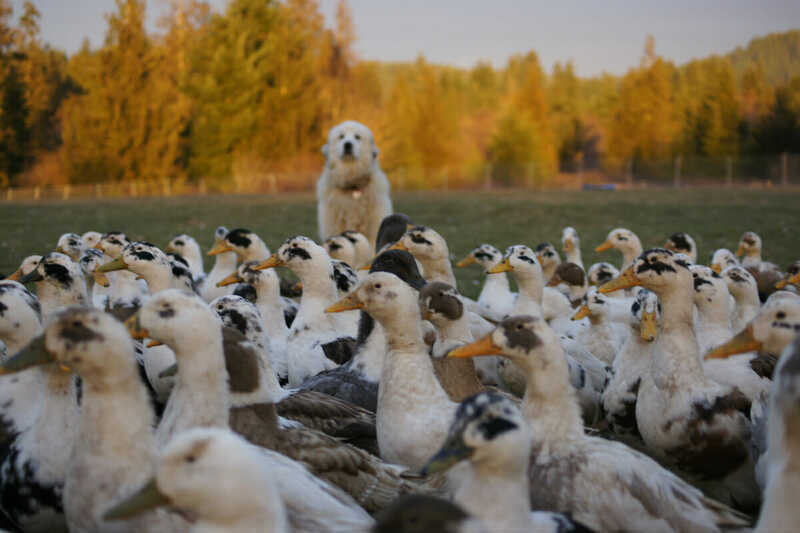 Meet this week's guest Instagrammers, Rachel Kornstein and Evan Gregoire, who raise poultry, fruit and Great Pyrenees dogs on Boondockers Farm in Beavercreek Oregon. Modern Farmer: Could you tell us a little about your farm? Evan Gregoire: We started our farm back in 2006 in Eugene. Two years ago we bought the property in Beaver Creek, right outside Oregon City. We really wanted to expand our reach to a lot more custumers and our big focus is education. Teaching other people about healthy food is kind of what we do. We also do some unique products like duck eggs, seed saving and heritage breeds. Lots of people still don’t know about organics, so there is a steep learning curve with some of the folks we deal with. We try to get into the community through farmers markets, doing conferences and workshops to try to get the community involved as much as possible. Rachel does a lot of the education, like our jams. We have 25 flavors of jams, it is crazy. We also sell to chefs in Portland, on farm pick ups and two farmers markets. MF: You guys also raise dogs? EG: We raise Great Pyrenees. We are probably one of a handful of that actually raise American Kennel Club registered Pyrenees for working, instead of showing. A lot of people raise a mix, but we like to keep the papers on everything so we can see the linage. That way you can sell real quality dogs that can work instead of being in the show ring. We have had four litters in six years. Each year we kept a puppy and established good protection for the poultry. MF: You were also nominated to be a US Slow Food delegate for a conference in Italy. EG: I am going to spend a month in Italy, traveling to different farms and then going to the Terra Madre conference in Turin. That is going to be incredible, it is like the food Olympics. There are 500 to 600 applicants and they pick a 100 or some. MF: When did you decide to join Instagram as a farm? EG: We have been doing Facebook and Twitter for a while. Instagram had always been in the back of my mind to do it, but I never had had a phone, I had a cell phone just not like an android or anything. Last year I got a new phone and I said “Instagram is the first thing I want to do.” I like photography, it has always been something that Rachel and I have been passionate for. It goes along with good marketing and social media. It was a choice because we love taking pictures. It has been fun. It is a good way for people to communicate, if they communicate through pictures, cause that is how I communicate. MF: Do you view Instagram more as a marketing tool? EG: I am doing a lot of things with it. On my feed, I have chefs and farmers. It is a way to see what chefs are doing and to stay current on the food scene in Portland as well as farms across the country. I am finding I get a lot of great feedback from other farmers. The pictures I put out there telling the story of what is going on each day. It is more of a connection to community than straight marketing. It is not direct marketing, it is almost like indirect marketing through community. MF: Are you looking forward to sharing anything in particular this week with our followers? EG: Defintely the heritage animals. I think people will be really excited to see the baby pigs. We are taking down some beautiful Quinoa, some dry beans, and green house construction is going around. Just telling the story about our animals and dogs and why we raise them. Some of our apples, people have been following our orchard production, we just started 500 apple trees this year. We have another farm dinner this week. Lots of cool stuff. This interview has been edited and condensed. All images courtesy Boondockers Farm.